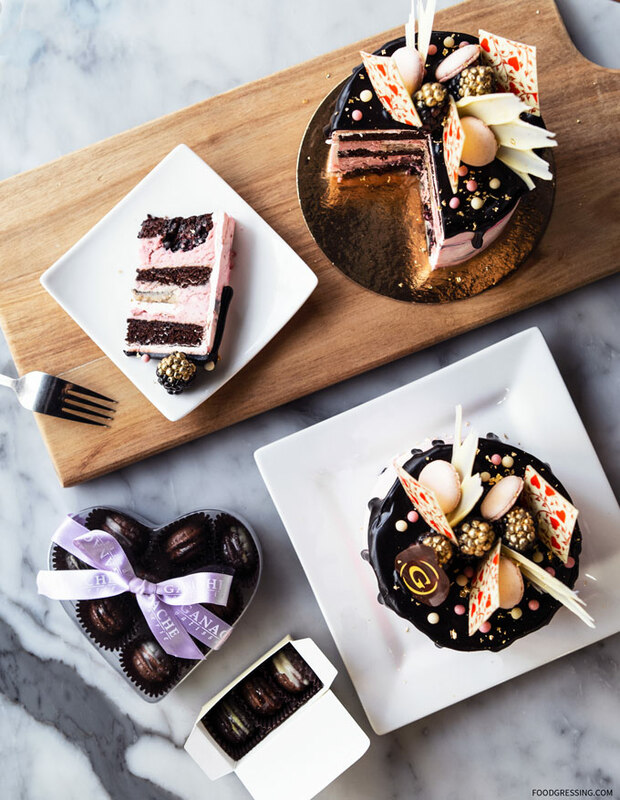 For Valentine’s Day, Ganache Pâtisserie in Yaletown is offering the Saint Valentin Cassis Hojicha Chocolat 2019. This cake has a unique combination of layers of fragrant hojicha chocolate cake, a fruity cassis mousseline filling, a hojicha créme brûlée, a lavender-cassis guimauve and fresh blackberries. 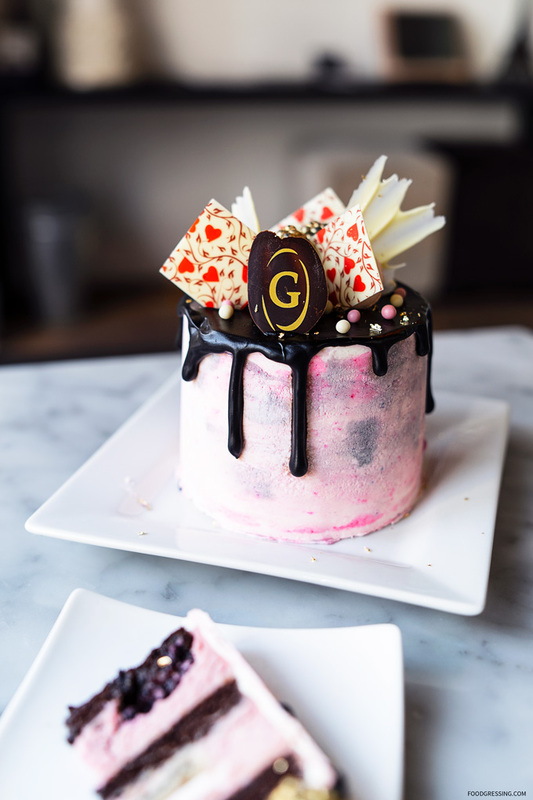 The entire cake is finished in a pink and grey marbled buttercream with a dripping chocolate glaze that is adorned with white chocolate fans, pink rose macarons, gold-dusted blackberries, Valentine’s chocolate decor, crispearls and gold flakes. The cake is designed to be shared generously with that special someone, though able to feed 4-6 people. The Saint Valentine Cassis Hojicha Chocolat 2019 ($39.95) will be available starting Friday February 8th and pre-orders are strongly recommended for pickups on Valentine’s Day, Thursday February 14th. I had a media tasting of the cake and enjoyed how moist and fluffy the cake was as well as the delicious and unique blend of sweet fruity cassis and hojicha flavours. It’s a beautiful and satisfying cake to be enjoyed with your beloved. 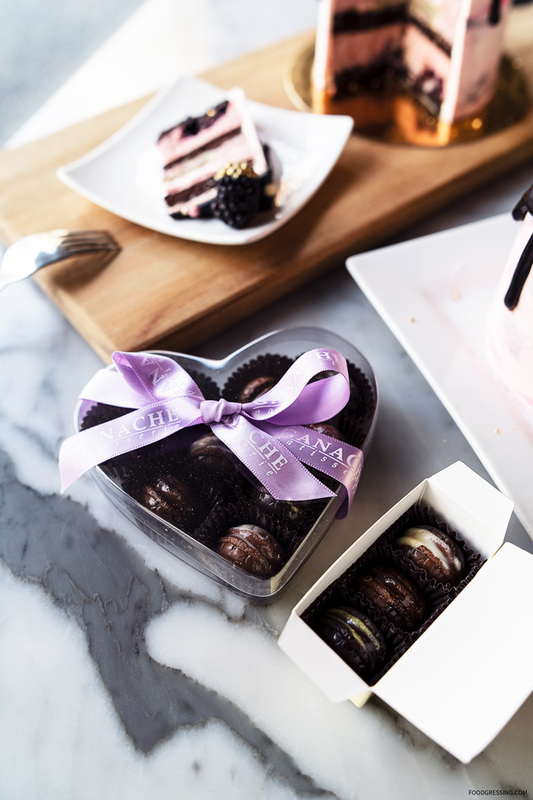 Ganache Pâtisserie also has many pre-packed housemade bonbons for gifting.